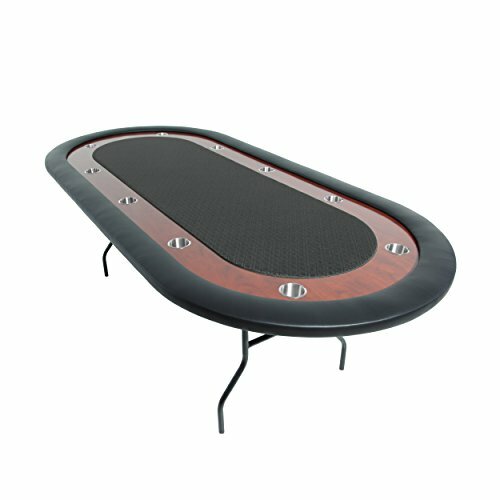 Compact enough to fit into your SUV, the easily portable Ultimate poker table from BBO Poker seats up to 10 and folds down for easy storage. The Ultimate has heavy duty steel folding legs, a sturdy reinforced frame, an easy-to-clean faux leather vinyl armrest (which is removable for quick changes to the playing surface), and a beautiful scratch-resistant laminate racetrack with ten 3-inch stainless steel cup holders. The Ultimate offers a choice of two playing surfaces -- poker felt or water-resistant suited speed cloth (a smooth polyester weave fabric that provides faster card slides). The table measures 92 x 44 x 30 inches (LxWxH). BBO Poker Tables manufactures stylish, high quality poker tables and game night tables for players who demand a premium showpiece at an affordable price. All tables are upholstered in California. In 2015, BBO Poker Tables was named the official poker table supplier of the World Poker Tour.